Online lesson plans and interactive websites for classroom use. Book your school tour today! To find out more about professional development opportunities at the MAG or to be added to our mailing list, please contact Anderson, Chelsea by email or phone 585.276.8971. Visit the Gallery’s Charlotte Whitney Allen Library & Teacher Resource Center for materials to borrow & use in the classroom. We’re located on the 3rd floor of historic Cutler Union. Visit during Library/TRC Open Hours or by appointment, 276.8999. Subscribe to a podcast of all our audio files using your feed reader, browser (Firefox, Opera, Safari, or IE 7 or later) or iTunes. Our podcasts include exhibition audio tours, the Director’s Tour, and performances on the Italian Baroque Organ. Watch videos of artists & students in the Gallery’s Creative Workshop. 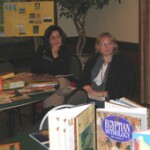 Consult with Carol Yost about using art in the classroom and to plan customized tours. Email or call Carol at 585.276.8973. Consult with Library staff on resources available in the Charlotte Whitney Allen Library & Teacher Resource Center. Call 585.276.8999 or email maglibinfo@mag.rochester.edu. The Memorial Art Gallery’s 2018-19 School Program is sponsored ESL Charitable Foundation and an anonymous foundation. Support for the Estelle B. Goldman Assistant Curator of Academic Programs is provided by the estate of Estelle B. Goldman. The McPherson Director of Academic Programs is endowed by an anonymous donor. Additional support for the School Program is provided by Anne O’Toole, the Joanna M. and Michael R. Grosodonia Fund, and New York State Council on the Arts with the support of Governor Andrew M. Cuomo and the New York State Legislature.